Fish is a great option for an evening meal as not only is it packed with flavour and goodness, but it is so low in points – especially now fish is 0sp! After craving something fishy for tea last week, I put together this recipe using a lot of ingredients that I already had in my fridge and the result was delicious. Both light and summery yet filling and satisfying. Best of all, the whole dish can be ready inside 20 minutes! Boil the potatoes in salted water for 15-20 minutes until soft. Preheat the oven to 180c. Meanwhile, lay two slices of the prosciutto vertically side by side on a chopping board. Repeat with the other two slices leaving a small gap. 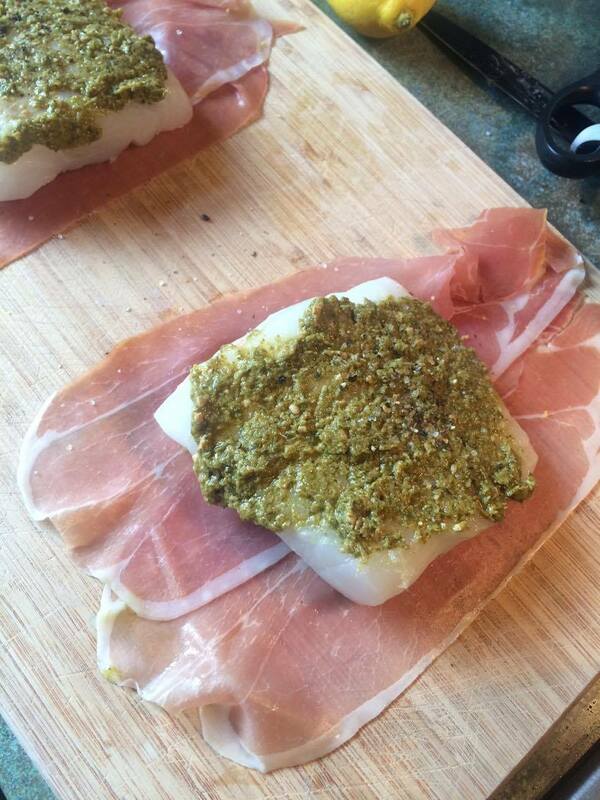 In the centre of two of the slices lay the cod, season with salt and pepper, squeeze over the juice of ¼ lemon and spread over 1 tsp green pesto. Repeat with the other cod fillet. 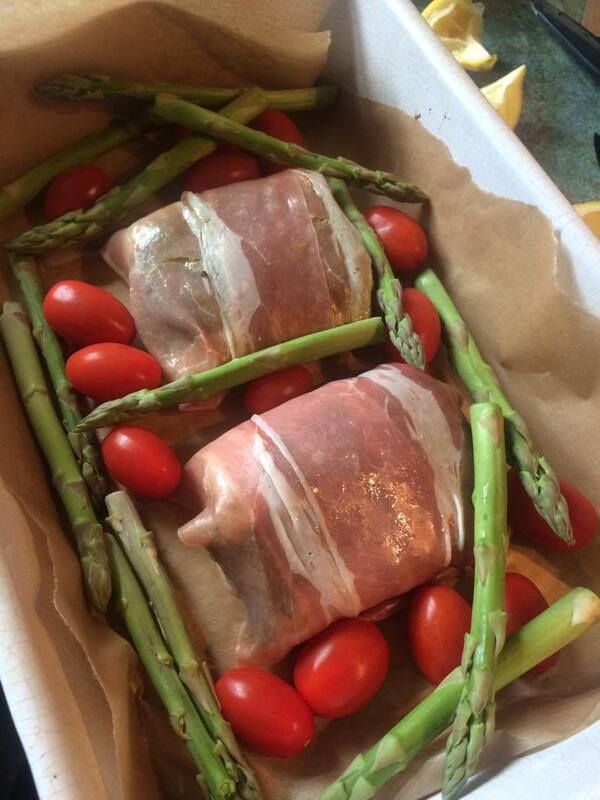 Wrap the prosciutto around the fish and pop seal side down into a baking dish (sprayed with 1kal). Scatter the tomatoes and asparagus around the fish, season and splash a little balsamic onto the vegetables (not the fish parcels). Pop in the oven for 12-14 minutes until the cod is cooked through and tomatoes start to pop. A few minutes before the cod and potatoes are ready take a frying pan, warm to a medium heat, spray with 1kal and add the butter. Once melted add the garlic and juice of ¼ lemon. Add the spinach and stir until wilted. This will only take a few minutes. 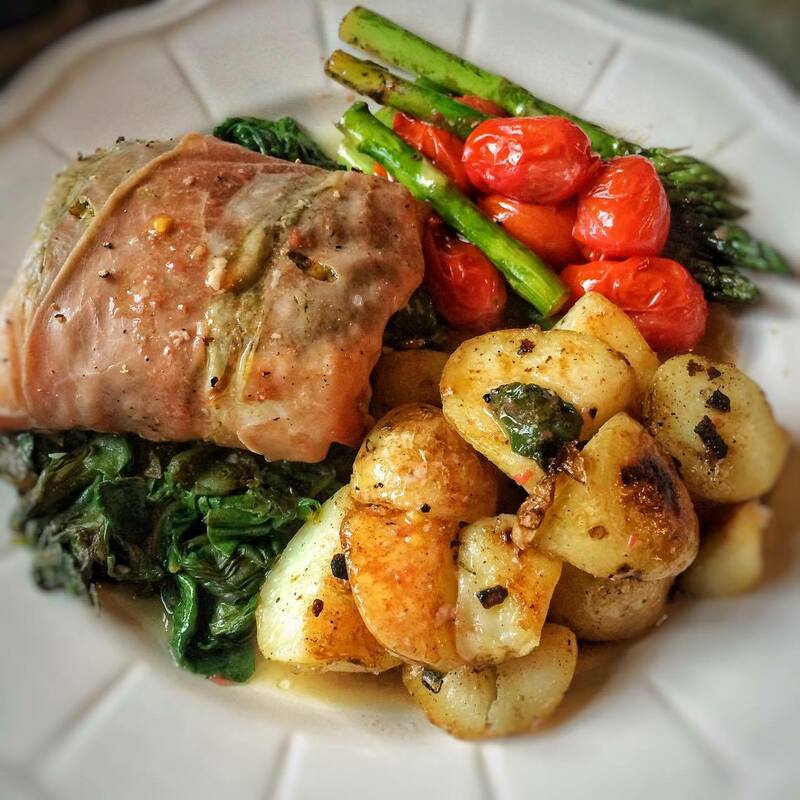 To serve pop the spinach in the corner of a plate and top with the fish parcels. Pop the tomatoes and asparagus next to the fish and then add the potatoes. The second time I made this I finished the potatoes off in a griddle pan and fryed in 1kal and a little garlic and parsley salt. This adds a nice crunch for 0sp so give this a try if you have time (the potatoes in the pic have been finished in the griddle pan). Pour the excess fish juices over the dish and fish with a final squeeze of lemon. This looks gorgeous and so quick and easy! The potatoes in the pic look like they’ve been roasted but the recipe just mentions boiling. Did you pop them in the frying pan for some colour at the end maybe? Doing a romantic meal for my hubbie tomorrow night. Would I be able to prepare this in advance? Just done this with griddled potatoes My husband and I both really enjoyed it. Thank you for the recipe. Absolutely delicious, I made this evening for me & my son & so easy. Thank you for all your great recepies, full of flavour but low on points.